Don't take any chances when it comes to your child's clothes. Make each piece of clothing last without the hassle. When it comes to your baby's clothes, you can't take any chances. Anything or anyone who touches your baby's skin can irritate him, or might cause an allergic reaction. Usually, the first culprit when it comes to skin irritation is what your child wears everyday, since it's what is constantly in contact with him (even more than you are!). 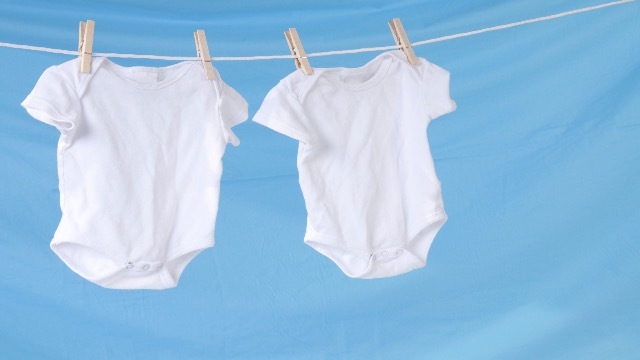 Here are a couple of ways to care for your baby's clothes. Watch out for loose pieces. Buttons, sequins or frayed ribbons can loosen over time, so it's best to either remove the pieces, or opt to buy clothes that don't have any unnecessary pieces on them. If ribbon ties from your newborn's kimono-like tops, snip the frayed edges and lightly burn the edges with a lighter to keep it from fraying. Letting food and dirt seep into their clothes will make it harder for you to clean the clothes in the long run. As soon as you see something, change him into a fresh set of clothes and let the dirty piece of clothing hang dry. Give your child's clothing a separate laundry basket. Mixing your child's soiled clothes with the rest of the family's laundry isn't advisable. Not only will it make it harder for you to find their itty bitty clothing in the mountain of big-people laundry (so many lost mittens and socks! ), adults' clothes gather more grime and dirt during their day as compared to your child's, and mixing the clothes in will contaminate your child's clothing. Wash their clothes by hand. Is there anything else more delicate than your child's clothing? Just like your own delicates, hand washing your baby's clothes will make sure that you know exactly how it's being taken care of, from the detergent and fabric softener that's being used, to the manner and intensity that it's being washed. Add fabric softener to the mix. After washing your baby's clothes with detergent, rinse them with water and include Downy Baby Gentle in the water for one last rinse. Fabric softeners will make your baby's clothes smell fresher, will lessen the wrinkles (meaning: shorter ironing time for you, yay!) and it will make the pieces softer to the touch. Your baby will definitely feel more comfortable in his own clothing now! It's a common misconception that you should not use fabric conditioner on your little one's clothes. What you actually need to avoid is the use of fabric conditioners that have ingredients that may be harmful to your child's skin. Downy Baby Gentle is dermatologically tested to be safe for your baby. It also has a mild scent that you and your baby will definitely love! Babies, especially newborns, hardly need freshly pressed and crisp clothing—they always prefer things and peices of clothing that are soft. If his clothes don't need to be pressed, skip this process altogether. It's tempting to hang everything that your child wears, but that's both costly and inefficient when it comes to space. Lightly folding without pressing the edges of the clothing afterwards will keep the clothes from getting unnecessary lines from your folding. Get rid of those lines for good by using fabric softener when you wash your baby's clothes. This article was created by Summit StoryLabs in partnership with Downy Baby Gentle.